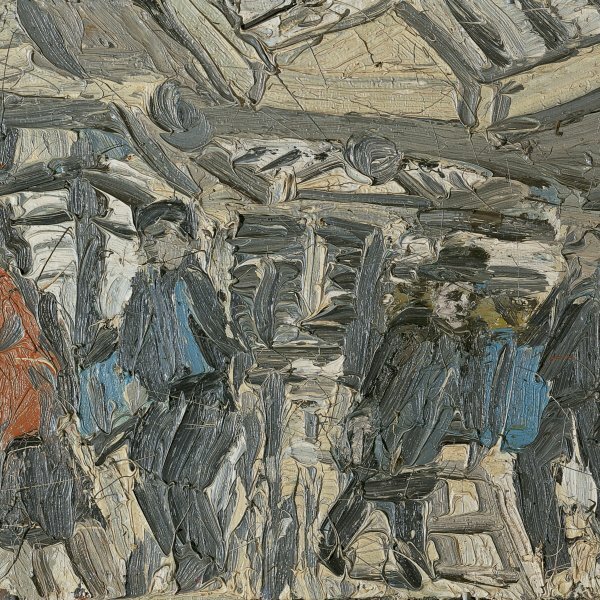 Associated with the British figurative movement known as the School of London, the painter Leon Kossoff has maintained the same style and themes throughout his artistic career. The son of Russian emigrants of Jewish origin, Kossoff studied at Saint Martin’s School of Art from 1949 to 1953 and at the Royal College of Art from 1953 to 1956.While studying, from 1950 to 1952 he also attended night classes taught by David Bomberg at the Borough Polytechnic, where he met Frank Auerbach. His work was first displayed in a one-man show at the Beaux Arts Gallery in London in 1957 and he exhibited regularly at the gallery until 1964. During the 1960s he taught at Regent Street Polytechnic, the Chelsea School of Art and Saint Martin’s School of Art, dividing his time between this activity and painting. From the outset Kossoff developed a highly material technique and has broadened his palette over the years from the earth shades of the early days. He paints chiefly portraits — always of people belonging to his close environment, such as family members and friends — nudes (the sitter is generally his wife Rosalind or a model called Fidelma) and scenes of London, usually places he has lived in, which he populates with the same people depicted in his portraits. He has been a lifelong admirer of the oeuvre of the Great Masters and his works sometimes include references to the paintings of Titian, Rubens and Rembrandt.